NEWARK, N.J. -- There's no denying that Adam Henrique of the New Jersey Devils and Gabriel Landeskog of the Colorado Avalanche are frontrunners in the Calder Trophy race for NHL rookie of the year. Even though Henrique has played 10 fewer games, he is tied with Landeskog atop the rookie scoring race with 46 points. On Wednesday, Landeskog scored once to overtake Philadelphia's Matt Read for the NHL rookie lead in goals with 20 -- five more than Henrique. They'll meet for the second time this season on Thursday when the Avs pay a visit to the Prudential Center. Each player notched an assist in the Nov. 30 matchup won by Colorado, 6-1. Landeskog has proven to be quite the physical specimen, doling out a team-leading 198 hits. Henrique is certainly no stranger to contact, with 74 hits and 50 blocked shots -- two more than Landeskog. 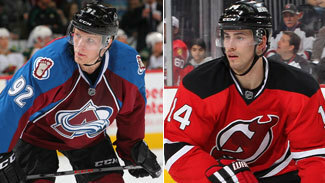 How do Colorado's Gabriel Landeskog and New Jersey's Adam Henrique measure up? the Windsor Spitfires and one more with the American Hockey League's Albany Devils before finally getting his shot with the big club. While Landeskog, the No. 2 pick last June, made a relatively smooth transition to the NHL in his draft year, it certainly required equal effort and determination. The gritty Swede had to work his way up the ranks through the Swedish Elite League -- he was the youngest player to suit up for Djurgarden at 16 years, 90 days -- before finally deciding to play in North America with the OHL's Kitchener Rangers in 2009-10. He was named the team's Rookie of the Year that season. The have both proved their mettle on more than one occasion. Henrique played through a three-inch scratch on his face after being struck by an opposing stick blade on Tuesday in Philadelphia. Landeskog battled flu-like symptoms on Monday -- and a temperature above 100 degrees -- and scored the game-winner 1:52 into overtime to defeat the Anaheim Ducks. Don't think those things go unnoticed. As a center, Henrique has been given plenty of opportunities in the faceoff circle. He leads all rookies by a wide margin with 431 faceoff wins on 883 chances, and sports a 48.8 percent winning percentage. At left wing, Landeskog has set a Quebec/Colorado franchise record for shots in a season by a rookie with 240 -- tops among all first-year players. Hall of Famer Peter Stastny held the former mark of 232 shots in 1980-81 with the Nordiques, when he won the Calder Trophy. Both have earned the respect of their coaches and, most importantly, their teammates. "He's so easy-going and he works so hard that everyone respects him," Landeskog's linemate, Ryan O'Reilly, said. There's never any hooting or hollering following a solid performance and both are readily available to speak to the media, win or lose. Reporters are almost guaranteed a smile every interview, too. Colorado coach Joe Sacco has been impressed with Landeskog's willingness to also play the role of leader at times. "It's easier to say stuff because you back it up with your play, but it's also in your delivery, and he's just got that way about him where it's positive," Sacco said. "It's not in a negative way. For a 19-year-old kid turning 20, to show that kind of leadership at a young age, it's a good quality to have and it bodes well for the future of this franchise." While each continues to play a major role in the success of their teams, don't think for a second Henrique isn't aware of Landeskog, or vice-versa. "Obviously, this is a spot that I didn't expect myself to be in," Henrique told NHL.com. "I look [at what the other rookies are doing] every once in a while. I try and look at everything, checking to see how teams are doing and how friends are doing." The Devils have had two players win the Calder -- Martin Brodeur in 1994 and Scott Gomez in 2000. Chris Drury was the only player to earn the Calder for Colorado in 1999, while Peter Forsberg (1995) and Peter Stastny (1981) garnered honors with the Quebec Nordiques. "It's been a crazy year so far, but [winning the Calder] isn't my main focus," Henrique said. "My main focus is to help the team win and we're in a good spot right now … trying to separate ourselves from other teams." "Obviously, this is a spot that I didn't expect myself to be in. I look [at what the other rookies are doing] every once in a while. I try and look at everything, checking to see how teams are doing and how friends are doing." Unlike Landeskog, who was drafted and given ample opportunity to play an immediate role with the Avs, Henrique was given his role when the Devils lost No. 1 center Travis Zajac at the start of the season. Henrique, called up from Albany on Oct. 22, has centered captain Zach Parise and Ilya Kovalchuk all season. "He just plays the game as if he's playing with you or I on the wing and that's not an easy mindset for a young guy to have with [Parise and Kovalchuk] with you," Devils coach Peter DeBoer said. "I think he's had an exceptional year." In 73 games with Albany last season, Henrique finished with a team-leading 25 goals and was second with 50 points. He won back-to-back Memorial Cup titles with the Spitfires of the Ontario Hockey League in 2009 and '10 and won a silver medal with Team Canada at the 2010 World Junior Championship. "You just see it," Avalanche goalie Jean-Sebastien Giguere said. "You see it on a guy. You see it the way he carries himself, the way he talks, the way he's not afraid to talk to guys and speak his mind between periods, the way he practices and the way it's in his eyes." In his second season with Kitchener in 2010-11, Landeskog had 36 goals and 66 points despite playing only 53 games due to an ankle injury. He played alongside current Carolina Hurricanes forward Jeff Skinner during the 2009-10 campaign. Skinner took home the Calder last season. "He should be talked about for [the Calder] … I think he's going to be a future captain in this League," Giguere told the Denver Post. "Their line [Landeskog, O'Reilly and Steve Downie] right now is the best line on our team. They're carrying our team. They play as well offensively as defensively."